Harmar's durable, American-made AL500 Universal Power Chair Lift is the worlds most popular outside platform lift. 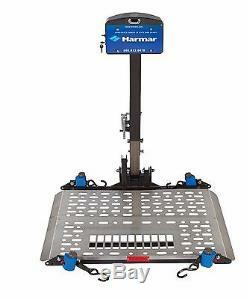 Features Harmar's Stars -N- Stripes aluminum deck design with Swing Away Mounting System. This model is dedicated to our veterans and commemorating Harmar's heritage as an American company. The AL500 is easy to operate and built to last for years of trouble-free use. The universal design safely transports the power chair without making any chair modifications. Lifting Capacity - 350 lbs (160 kg). Aluminum Deck Size - 27.5" X 39". Installed Weight - 93 lbs. 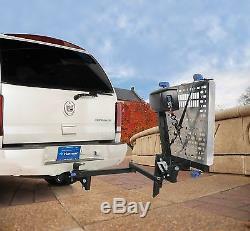 Hitch Height - 5" to 18" Range. Class II or Class III Hitch. Stars -N- Stripes Aluminum Deck. The item "Upgraded Harmar AL500 Universal Power Chair Lift with Swing Away Mount System" is in sale since Sunday, March 26, 2017.